Winter can be a really fun time of year, with all of the holidays and celebrations that come during this season. However, many people find that when winter hits, it becomes easier and easier to stay trapped indoors and to stop getting as much exercise as they need. This is particularly true for seniors. While warmer temperatures make it much simpler to get out and go for a nice walk, when you spend most of your time trapped indoors, your exercise routine can get in a rut as well. This is why it is so important to make sure that you have an exercise plan that you can perform indoors, where it is safe. While going to a local gym or fitness center is a great option for the winter, it is also smart to have a backup plan in case the weather is bad and you can’t drive. Fortunately, there are plenty of home DVDs, online workout streaming services and more that make it easy to access workout classes right from the comfort of your own home. Pilates. A great exercise for building core strength and toning muscles without putting much pressure on the joints. 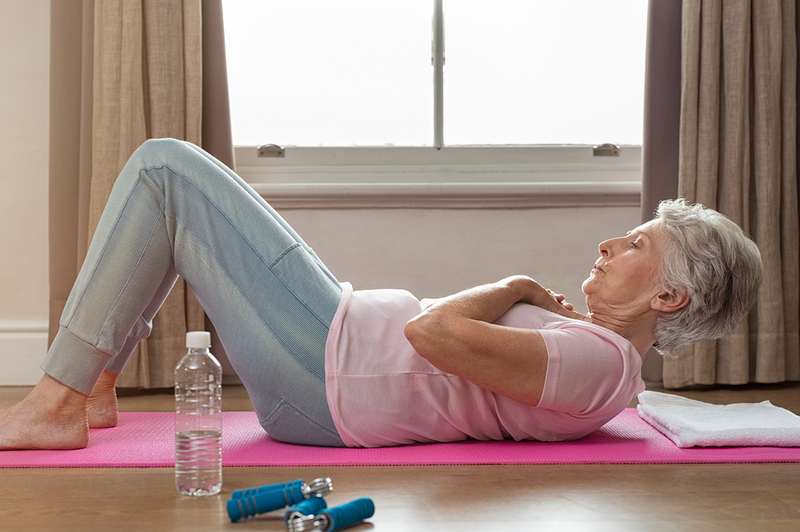 Building the core is a great way for seniors to prevent falls. Yoga. This is a great way to keep the muscles loose and limber and is a great exercise for seniors who want to keep their muscles loose but active. Yoga is also great for stress relief and finding inner peace—which can be helpful on days when seniors feel cooped up in home. Swimming. While most seniors won’t be able to swim inside their own home, this is a great exercise for seniors during the winter as it doesn’t put extra stress on the joints and is a great cardio and muscular workout. Body weight workouts. There are many home DVDs and exercise videos that are designed to be complete body weight workouts. These are great for seniors because they don’t require heavy weights—meaning they are easy to do at home, and you are less likely to get injured lighting something too heavy. The great part about these workouts is that they aren’t only perfect for doing inside, but they are also low-impact workouts that won’t cause extra stress on the body. These are great exercises for seniors who still want to stay active and healthy but who don’t want to injure themselves while working out! They really are the best of both worlds.